As a fantasy that manages to be blunt with its message and light with its adventure, The Kid Who Would Be King fits snugly into the familiar armor of a plucky kid-oriented adventure just for young fantasy seekers. There are no in-jokes for the adults nor a surprise for the direction this story is going with its magical tale of swords, knights, magic, and demons. It’s perfectly suited to be a kids-only affair, where the wee ones get a chance to skip class and save the world while wielding a sword. It’s the type of production where the adults will smile, though not as wide as the kids who are sure to dig it. The story of the modern kid Alex becoming the next hero of the mystical sword Excalibur isn’t a particular new one with its routine assembly. He’s the plucky young kid that tries to stand up to the bullies and save his nerdy best friend Bedders. He tries to do what’s right but it’s harder to be someone so brave in a world constantly heated with hope dwindling. Yeah, there’s an obvious parallel to the whole Brexit situation and Trump era, but only the most apt of adults will connect the dots. The kids will mostly just relate to the picture in the same way 1980s pop culture embraced that apocalyptic odor in the air. With Alex’s resolve growing weaker and the bullies reigning supreme over lunch money, it is an opportune moment for the sinister Morgana (Rebecca Ferguson) to rise from the underworld and get her revenge on humanity during a solar eclipse. It is when this mystical tale takes on a lot of rules that most kids won’t question as much as the adults. The first question: Why is Excalibur inside a cement beam at a construction site? Answer: So Alex can get to it. There’s also the additional magic of demons only being able to come out at night to kill the sword-wielder and his knighted comrades, the rest of the world separated by dimensions or whatever. Few characters question these magical aspects, considering a kid who gets a chance to secretly fight a war for the planet at bedtime won’t question the chance to shirk going to sleep for being a hero. Keeping Alex up on all this lore is the presence of Merlin, who would seem most fitting in his older form of Patrick Stewart but is even more fun as the lanky teenager Angus Imrie. He’s a magical fish out of water that uses his fancy spells delivered through fancy hand motions to get around. His exchanges are genuinely hilarious, especially when he reveals that there’s an immortal potion for wizards that involves fried chicken, ice cream, and soda. Lucky Merlin, living forever on the stuff that’s slowly killing me. The stakes are fairly low for a film such as this and I must admit I did find myself being taken out of the film for just not being that engaging for adults. Veterans of adventure films can likely set their watch to how this story will go down and all the story beats arrive right on schedule. They may even be dismayed that the film’s grand message of trusting the next generation to work together for a better tomorrow. But given the positive message and the fact that the kids get to save the day without a single adult lending them a hand, there’s something more admirable from afar, especially when I overheard some kids leaving the screening talking about wanting to see more movies like that. 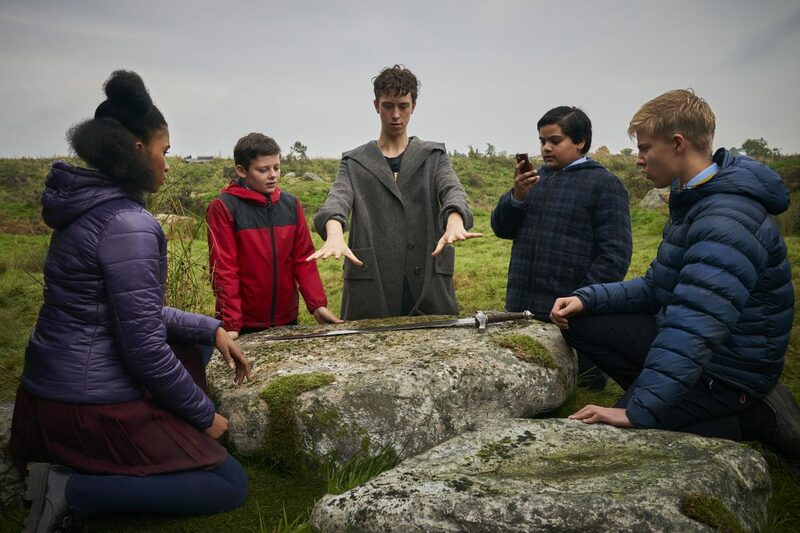 It’s hard to say if Joe Cornish’s small fantasy film will make a dent but I can at least say it made one kid more open to other fantasy films. And that’s pretty cool when considering the influence this charming little starter fantasy will inspire in the younger audience.